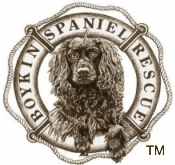 Kinley Success Story - Boykin Spaniel Rescue, Inc. 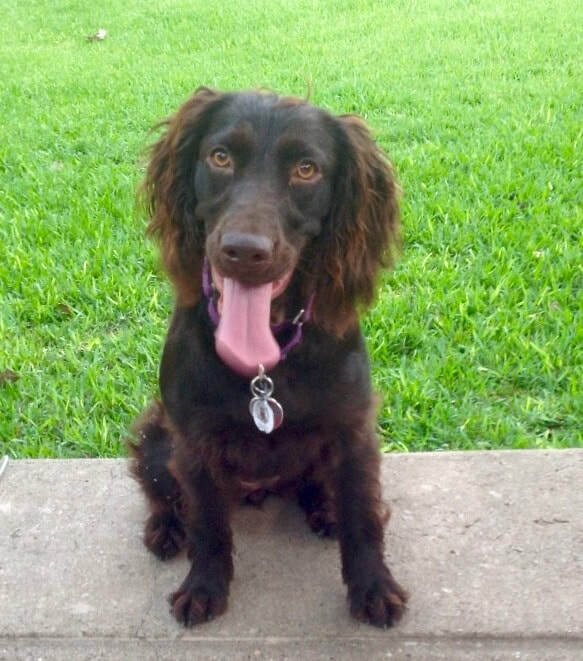 Original BSR Bio: Kinley is an approximately 1 yr old female Boykin with a beautiful coat, long legs and weighs a perfect 38 lbs. Found as a stray, she came to her foster family with no socialization or manners, but has learned all sorts of good behavior and commands. She is a very energetic, curious happy and playful Boykin. Although still a wild child, Kinley honestly wants to do the right thing and learn to be a good Boykin. With the help of some private training she is learning the basic commands, now likes her crate, sleeps quietly all night long. She is learning not to run and jump when free inside. Easily excitable, she is still a bit of a bull in a china closet as she doesn't realize her own strength and sometimes is not aware of objects around her. She is learning to walk on a leash but still pulls in an effort to explore things new to her. She responds nicely to a calm, firm and patient approach. Strong treatment and raised voices have a negative effect. She is respectful of other dogs, but is untested around children and cats. She enjoys being outside with her foster canine siblings but is not happy left outside by herself. What she enjoys most is working with her humans in structured activities and training. The ideal home for Kinley would be someone physically strong and patient, who can give her a job and plenty of exercise. A commitment of time and resources to continue work on obedience lessons is essential for her. A calm and quiet household would be best, with another calm, non-dominant dog. This is BSR Kinley reporting in. I am in my forever home and am so glad BSR took a chance on me, cause you see I had a rough start and no fault of my own, but I did not know how to behave with humans and am very strong! Mom thinks I was born and raised in a concrete kennel with very little human interaction. It took me a long time to learn to use the grass. I was very hard to handle and did not know how to pay attention and did I mention I am very strong? Mom called on one of her former trainers to get some professional help. I am a changed gal. I stay on my own rug quietly in the house with my 2 sisters, I am getting real good at walking on a leash, I have learned a ton of commands – and am working towards my Canine Good Citizen Award. You see, I love people and other animals very much, and I am smart and anxious to learn. I even go to an outdoor cafe with a group of friends and sit patiently! People walk by and smile at me and always ask about my breed. Mom’s trainer says I should think about rally since I have shown so much progress. I know mom says I have a lot of drive. I observed my older sister (in the background) in the dove field last year and mom is going to start me this year. Mom thinks I would be a great Quail dog- whatever that is. This is me with my favorite Ball on my ‘work bench’ and that is one of my sisters, Belle in the background. Thanks for asking about me!